someone has already managed to refine to the +10/+11?, let us all know if it already happened. in my case refining with 22 characters and could not even refine to +7. i hit +8 once and picked up the 2 mental pots, didnt get any higher yet though. 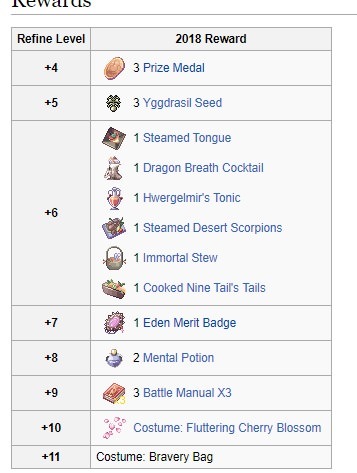 I dont know if this is true but the irowiki guide says the +11 prize is a costume bravery bag. ooooo a certain omitted website is hinting at this being a heroic backpack costume! Edited by VModCinnamon, 27 October 2018 - 06:34 AM. Mod Edit: Even if the image is cropped, please do not link/share RMS things here. Edited by PTroy, 26 October 2018 - 06:03 PM. nice final rewards, now people can hide their wings inside the backpack. 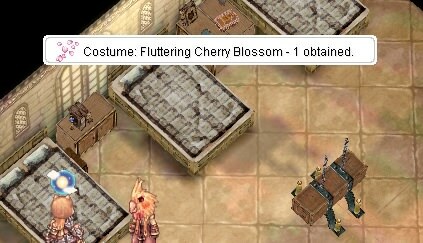 if anyone happened to get the hbp costume, try to see if its already included as part of enchantable garment costume or not in malangdo npc. Maybe I should try my luck at this. It's been a rather lucky weekend for me. lol @ warp portal for introducing an event that no one can 'win'. you guys know no ends of troll. 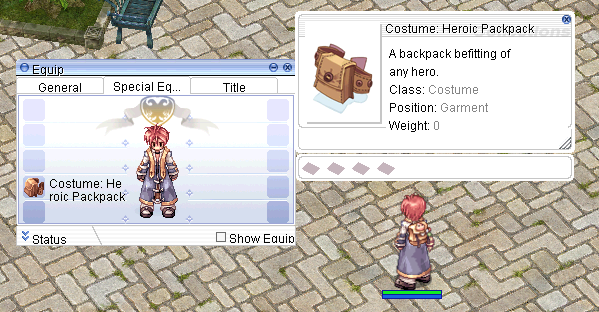 I actually traded HBP costume from other player so at least I can confirm that does exist. Currently I requested support to verify that the costume is legit. It's confirmed client side via an entry in the description patch last maintenance. Same patch fixed the Spooky Bear costume sprite. It's a costume HBP at +11, it's not a secret anymore. +10 is the ol same costume flatterme shareme yerbossom. Haven't gone past +8 and lost interest now. I was told that they have technical difficulties on their side with no estimation for resolve so might take a while until they can do the check I'll edit this post if it turned out to be fake.